As transportation departments continue to implement Every Day Counts (EDC) innovations in their projects and programs, these efforts are enhancing safety and saving lives on the Nation’s roadways. EDC innovations are used on six projects honored in the 2017 National Roadway Safety Awards program, sponsored by the Federal Highway Administration and Roadway Safety Foundation to recognize safety achievements that help reduce fatalities and serious injuries. The “Noteworthy Practices Guide” features case studies on the award-winning solutions. Roadway departure crashes accounted for 38 percent of fatal crashes in Delaware, with half of these occurring on horizontal curves. The Delaware Department of Transportation (DelDOT) implemented high-friction surface treatments (HFST)—pavement overlay systems that provide enhanced skid resistance—through the State’s Systemic Safety Improvement Program. DelDOT’s before-and-after crash data showed that roadway departure crashes dropped an average of 56 percent at the more than 20 locations treated with HFST by April 2017, and analysis indicated an overall benefit-cost ratio of 24. 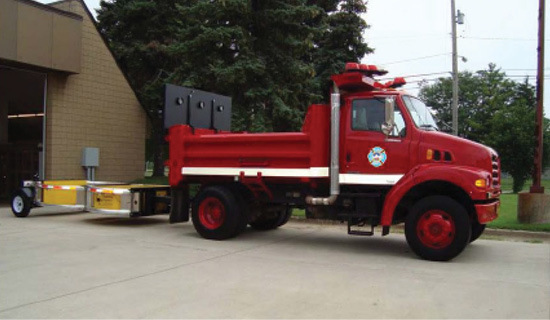 In Michigan, a dump truck with a crash attenuator shields fire trucks responding to highway incidents. Credit: Michigan Department of Transportation. After vehicles struck fire trucks responding to crash scenes in Grand Rapids, MI, on three occasions in less than a year, a multi-agency traffic incident management team developed strategies for shielding and clearing crash scenes. 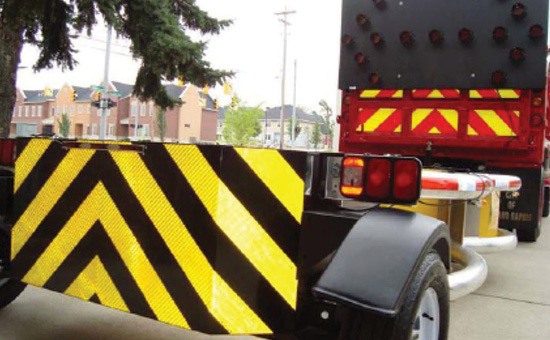 They include the Nation’s first crash attenuator truck used by a fire department, expedited dispatch of tow trucks, and high-visibility markings and signs for first responders. This combination of initiatives resulted in a 31 percent decrease in tow truck response time, a 45 percent drop in secondary crashes, and zero vehicles hitting on-scene fire trucks in the past 2 years. Over the past decade, 8,752 motorists died on Missouri’s roads. As part of its Toward Zero Deaths strategy, the Missouri Department of Transportation (MoDOT) used data-driven safety analysis (DDSA) to identify 31 locations with safety concerns. Five design-build teams competed to offer MoDOT cost-effective safety treatments for the trouble spots based on “Highway Safety Manual” analyses. The winning bid included HFST, a roundabout, rumble strips, and other safety measures that are expected to prevent 73 fatal and serious injury crashes over 10 years. The project was completed 9 months ahead of MoDOT’s requirement in the initial procurement. The intersection of two roads in Burlington County, NJ, was pinpointed for improvements after experiencing severe crashes. The use of DDSA helped engineers identify a roundabout (see cover illustration) as the preferred design alternative for the intersection. Right-angle and left-turn crashes dropped 100 percent after the roundabout was built, and citizen support led to construction of three more roundabouts in Burlington County. The New Jersey Department of Transportation now promotes roundabouts for State roads and is spearheading a pilot roundabout program for intersections under local jurisdiction. To evaluate whether safety investments achieved their real-world potential, the Tennessee Department of Transportation (TDOT) used DDSA to analyze the effectiveness of 261 safety projects in its Highway Safety Improvement Program from 2010 to 2015. The analysis showed a 60 percent reduction in overall crash frequency after recommended countermeasures were implemented and identified locations in need of further study or safety improvements. TDOT plans to continue to use DDSA as additional projects are completed. A cost-effective instant roundabout cut crashes by 89 percent at a Virginia intersection. Credit: Virginia Department of Transportation. When crashes at a congested northern Virginia intersection rose to nine per year, with nearly half involving injury, the Virginia Department of Transportation (VDOT) sought a faster solution than constructing a traditional roundabout. 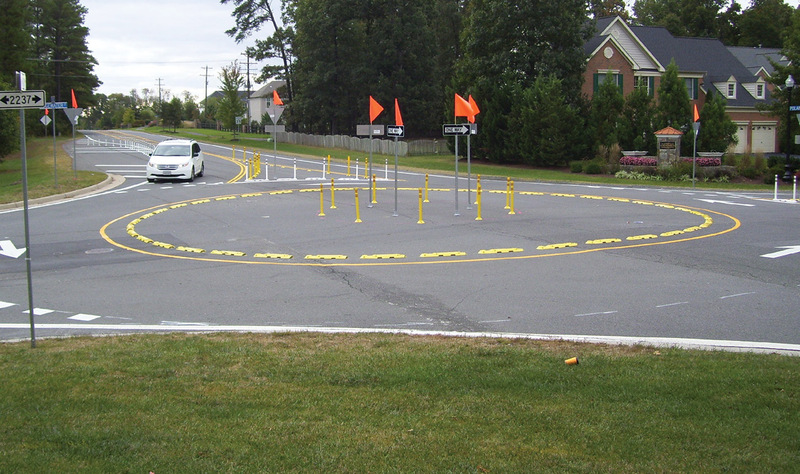 With community support, VDOT installed an “instant roundabout” in less than a week using off-the-shelf markings, tubular markers, and plastic curb sections. The solution reduced injury crashes by 89 percent and cost 95 percent less than a traditional roundabout. The positive results led VDOT to consider using instant roundabouts at other locations as an immediate fix to prevent crashes while permanent solutions are implemented. For information on the National Roadway Safety Awards, contact Tara McLoughlin of the FHWA Office of Safety. Local entities own about 75 percent of America’s road miles. Almost 50 percent of the Nation’s roadway fatalities occur on these roads, creating a need for local agencies to invest their limited safety dollars as strategically as possible. (EDC-4) data-driven safety analysis (DDSA) deployment team is advancing locally focused initiatives. One approach promotes local road safety plans (LRSPs). 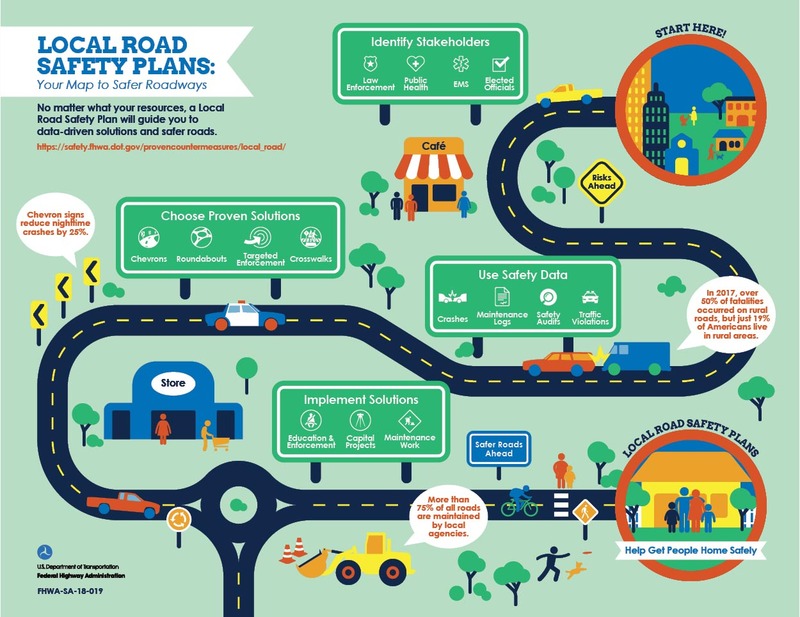 LRSPs provide a framework for identifying, analyzing, and prioritizing roadway safety improvements and strategies on local roads. These plans are tailored to local issues and needs. The process results in a prioritized list of issues, risks, actions, and improvements that can be used to reduce fatalities and serious injuries on local road networks. The plans are so effective in identifying and addressing local safety issues that they’re included in the Federal Highway Administration’s proven safety countermeasures. Anderson also emphasized that, where possible, agencies should coordinate their LRSPs with their State Strategic Highway Safety Plan. “When projects in an LRSP align with the State Strategic Highway Safety Plan, they are more likely to qualify for Highway Safety Improvement Program funding,” Anderson said. Some local agencies may believe they don’t have enough quality data to draft a plan, but LRSPs are scalable and can usually be created with on-hand data and other information. In Washington, for instance, 33 of the State’s 39 counties have developed their own LRSPs of varying length and complexity, depending on staff resources. In a survey on Washington LRSPs, 100 percent of respondents reported that the effort was useful for identifying safety priorities (38 percent reported “very useful” and 62 percent reported “somewhat useful”). The EDC-4 DDSA team is partnering with the National Association of County Engineers (NACE) to deploy the use of LRSPs and help local agencies develop plans. The partnership launched a pilot project focusing on 26 counties in California, Colorado, Florida, Nevada, Ohio, and Wisconsin. The pilot provides agencies with a blended learning experience that includes technical assistance, a series of webinars, and a hands-on workshop where participants leave with a draft plan in hand. See FHWA’s library of DDSA resources. Watch an Innovation Spotlight video on DDSA. Contact Jerry Roche of the FHWA Office of Safety or John McFadden of the FHWA Resource Center for information and technical assistance. The goal of the Every Day Counts (EDC) initiative on safe transportation for every pedestrian (STEP) is to improve uncontrolled crossing locations to reduce and ultimately eliminate pedestrian fatalities, says Rebecca Crowe, Federal Highway Administration transportation specialist and a leader of the EDC STEP deployment team. In Alexandria, VA, a road diet project included crosswalk improvements such as a refuge island to provide a place for pedestrians to stop while crossing the street. Credit: City of Alexandria, VA.
By the time EDC round four (EDC-4) ends in December 2018, half the States plan to attain post-deployment level. That means these States will be either assessing the performance of and processes for advancing STEP countermeasures and preparing for full deployment or adopting STEP strategies and policies as a standardpractice. Crosswalk visibility enhancements, such as crosswalk lighting, enhanced signing and marking, and curb extensions, help drivers better detect pedestrians. Pedestrian refuge islands provide a safer place for pedestrians to stop at the midpoint of a road before crossing the remaining distance, which is particularly helpful for pedestrians with limited mobility. Pedestrian hybrid beacons (PHBs) provide a stop control treatment for higher speed multilane roads where pedestrian volumes aren’t high enough to warrant a traffic signal. Road diets, which reconfigure a roadway cross-section to safely accommodate all users, can reduce vehicle speeds, cut the number of lanes pedestrians must cross, and create space for new pedestrianfacilities. “Agencies across the Nation have installed these treatments to provide pedestrian crossing opportunities, improve visibility, reduce vehicle speed, shorten crossing distances, and/or improve driver yielding,” Crowe said. 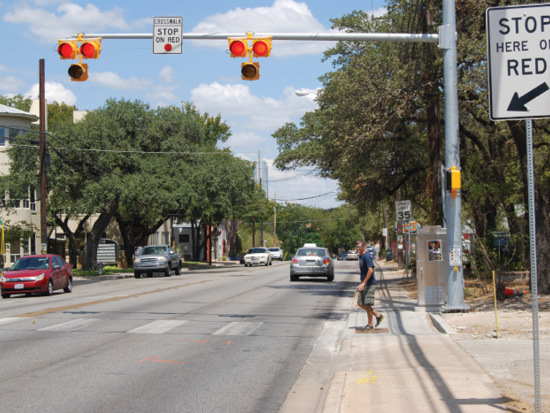 Pedestrian hybrid beacons enhance safety for walkers crossing multilane roads in Austin, TX. Credit: Austin, TX, Transportation Department. 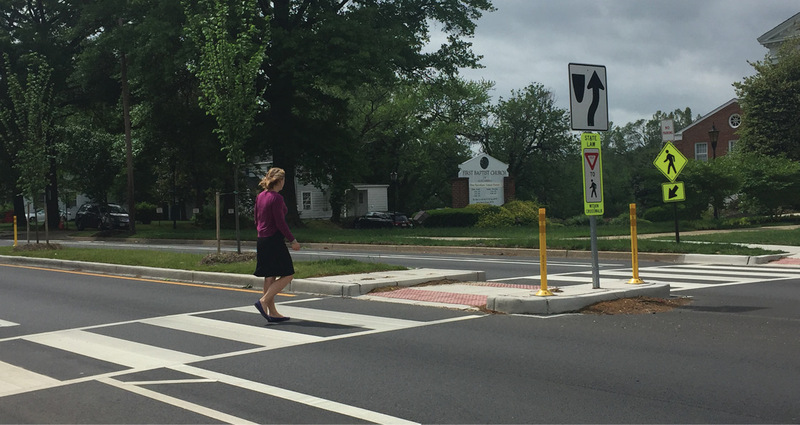 In Alexandria, VA, no crashes involving pedestrians occurred in the first year after installation of a road diet project with crosswalk visibility improvements at seven pedestrian crossings. That compares to an annual average of seven pedestrian crashes during the previous 10 years. Research on numerous road diets found a 19 to 47 percent reduction in overall crashes. The expected crash reduction varies, based on factors such as traffic volume and surrounding land use. PHBs are typically installed to provide pedestrian crossing opportunities across higher speed multilane roads. In Tampa, FL, the Florida Department of Transportation (FDOT) installed PHBs at three locations along a six-lane road. In the first year after implementation, bicycle and pedestrian crashes dropped to seven, compared to the previous 6-year average of 20 a year. In Austin, TX, examination of eight PHB sites on different four-lane roads showed that drivers yielded to pedestrians between 87 and 97 percent of the time. Other communities and States that have adopted policies and procedures to deploy STEP treatments include the city of Boulder, CO; Lexington (KY) Area Metropolitan Planning Organization; North Carolina Department of Transportation (NCDOT); and Oregon Department of Transportation. NCDOT adopted “North Carolina Pedestrian Crossing Guidance” to promote consistency in crossing treatment recommendations across the agency’s 14 divisions. A four-step flowchart walks users through sequenced assessments that result in a recommendation, required action, or no requiredaction. View an Innovation Spotlight video on STEP. Watch a webinar on STEP for local agencies. See tech sheets on the STEP countermeasures. View a process graphic for selecting countermeasures at uncontrolled crossing locations. Contact Becky Crowe of the FHWA Office of Safety or Peter Eun of the FHWA Resource Center for information and technical assistance. The first Delaware Department of Transportation (DelDOT) Innovation Fair showcased ingenious ways employees are meeting the agency mission to be innovative and efficient while providing superior customer service. Held in Dover, DE, in October 2017, the fair featured nearly 40 innovations—including Every Day Counts (EDC) technologies and practices—in stages of development from prototype to full implementation. The Third Eye, a mirror that attaches to a plow, improves safety and visibility. Credit: Delaware Department of Transportation. DelDOT Leadership Academy graduates organized the event in partnership with the Delaware State Transportation Innovation Council and Federal Highway Administration. The inspiration came from the Missouri Department of Transportation’s decade-old Innovations Challenge Showcase. More than 150 DelDOT and FHWA employees made the rounds at the DelDOT Materials and Operations Resource Center to view colleagues’ innovations. Many of the innovations address everyday challenges DelDOT staff encounter. When driving a snowplow with a wing, for example, it’s difficult to see on the right side of the truck. The location of the wing in the raised position blocks the mirror, but extending the mirror bracket could create a hazard during plowing operations. 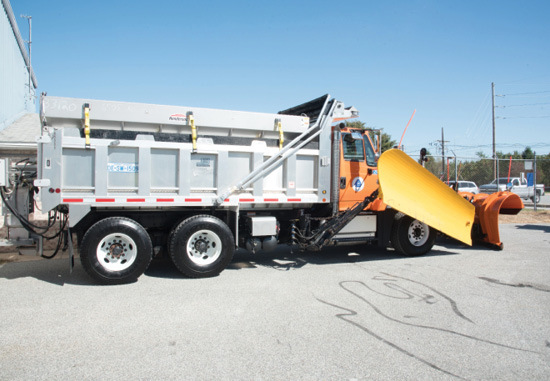 The solution featured at the DelDOT fair is the Third Eye, a convex mirror that mounts on the plow to eliminate the blind spot when the wing is raised. This simple idea improves visibility and safety during snow removal operations. DelDOT is developing a truck hitch mount that holds warning signs to enhance worker and motorist safety. Credit: Delaware Department of Transportation. 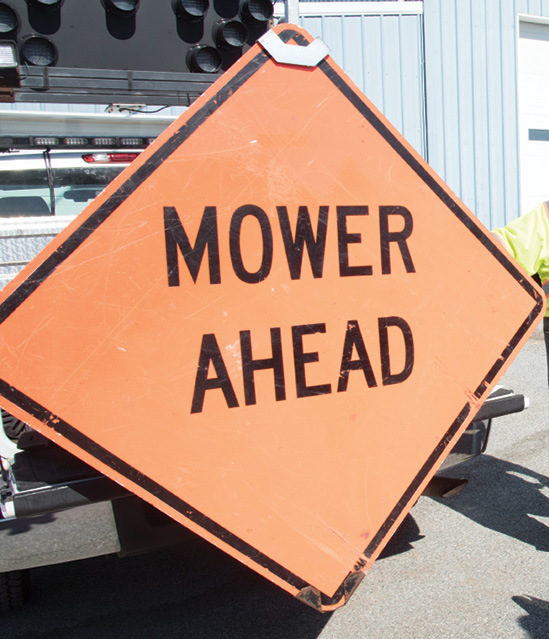 During road maintenance operations, work crews must set up warning signs, such as “MOWER AHEAD.” Motorists may overlook the signs or forget about them by the time they get to where the mower is, and crews must retrieve and reset the signs when they move to the next location. DelDOT staff is developing a hitch mount to hold a warning sign on the back of the crew’s pickup truck. This saves time on moving and setting up signs and ensures that signs remain close to work in progress, enhancing safety for workers and motorists. DelDOT is reviewing the device to determine whether it meets Federal “Manual on Uniform Traffic Control Devices” requirements. Another solution is about improving productivity. DelDOT’s in-house mechanics spend time going back and forth from work bay to office to perform tasks such as researching issues, checking for parts, completing orders, and filling out time cards—time they could spend diagnosing and repairing vehicles. A pilot program equipped mechanics with tablets to use on the job, providing them with flexibility and mobility and enabling them to perform their jobs more efficiently. The pilot is expected to save DelDOT money in the long run. In addition to seeing what their colleagues created, fair participants visited displays to learn about EDC innovations DelDOT is deploying, such as innovative project delivery techniques to develop and construct projects faster and more efficiently. DelDOT used the design-build technique to deliver the State’s first diverging diamond interchange (DDI) at State Routes 1 and 72 within a year. Using the design-build process enabled DelDOT to select a team to assume responsibility for both the design and construction phases of the project and open the interchange to traffic by November 2016. DelDOT chose the DDI concept to improve safety and reduce congestion at the interchange. Plans are in the works for a 2018 fair. New to the invitation list will be students from high schools, vocational-technical schools, and STEM—science, technology, engineering, and math—programs. View a video of DelDOT Innovation Fair highlights. Contact LiWen Lin of DelDOT for more information. 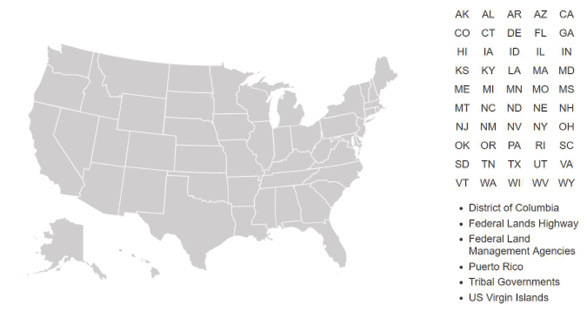 Click on the State Innovation Accomplishments map for details on STIC Incentive projects, as well as Accelerated Innovation Deployment Demonstration projects and STIC network contacts. When transportation stakeholders need a boost to make today’s innovations tomorrow’s standard practices, they can turn to the State Transportation Innovation Council (STIC) Incentive program. The STIC Incentive program offers funding of up to $100,000 a year per STIC to offset some of the costs of standardizing innovative practices by a State transportation agency or other public-sector STIC stakeholder. Incentive funds enabled the Florida STIC, for example, to advance pedestrian safety and the Virginia STIC to develop standard drawings for piles with carbon fiber-reinforced polymer (CFRP) strands. To support its effort to reduce pedestrian fatalities, the Florida Department of Transportation (FDOT) needed a cost-effective tool to evaluate the safety and accessibility of pedestrian facilities and prioritize improvements. With the help of STIC Incentive funds, FDOT developed the Safe and Accessible Pedestrian Facilities Inventory Model (SAPFIM), a software application State and local agencies and metropolitan planning organizations can use to collect and manage information on facilities such as sidewalks, curb ramps, and crosswalks. The SAPFIM tool enables agencies to efficiently inventory sidewalk infrastructure and safety features using tablets and simple measuring tools such as tape measures and levels. Users can photograph conditions and map locations to help prioritize features and areas needing improvement to meet Americans With Disabilities Act standards. SAPFIM includes data management tools that can incorporate high-priority needs into work programs. FDOT cooperated with the Broward Metropolitan Planning Organization, Florida International University, and Federal Highway Administration to develop and implement SAPFIM. As part of the STIC project, several agencies tested SAPFIM and provided feedback that the project team used to modify the software and user’s guide. Corrosion of prestressing strands in concrete piles was a concern for the Virginia Department of Transportation (VDOT) when steel-reinforced concrete structures were located in marine or brackish environments. These environments can expose the reinforced concrete to chloride-containing salts. As the chlorides in the salts diffuse into the concrete, they corrode the steel strands, which compromises the strength of the pile. CFRP doesn’t corrode when exposed to chlorides, so piles with CFRP strands are not susceptible to corrosion. Because VDOT uses standard designs for conventionally reinforced prestressed concrete piles, the agency wanted to develop standard specifications and drawings for prestressed piles with CFRP strands. The Arkansas Department of Transportation plans to conduct a corridor study to identify and implement safety countermeasures in the Every Day Counts (EDC) initiative on safe transportation for every pedestrian. The Iowa Department of Transportation will advance the use of virtual reality technology for transportation projects to improve public outreach and technology transfer. The Kansas Department of Transportation will develop an efficient standard procedure to evaluate concrete bridges with unknown reinforcement details to establish approximate load ratings. The Ohio Department of Transportation will create a decision matrix for applying community connections approaches for designing and building projects that allows for multiple variables and scenario planning. Contact Sara Lowry of the FHWA Center for Accelerating Innovation for information on the STIC Incentive program. Contact your State EDC coordinator for assistance with STIC Incentive applications. As part of its deployment of pavement preservation (when, where, and how) strategies, the Alabama Department of Transportation (ALDOT) is training staff members on selecting preventive maintenance projects. The training is tailored to an area or region by using pavement prioritization reports, videos of local roads, and case studies. The training will lead to standardized ALDOT preservation selection methods for both project locations and treatment types. The training is being modified for use by local governments. The Colorado Department of Transportation (CDOT) is using two-dimensional (2D) hydraulic analysis and 3D imaging to improve project quality and enhance project delivery efficiency. In applying these technologies to a design to replace the State Highway 60 Bridge over the South Platte River, CDOT found it could reduce erosion potential on adjacent private land and in the right-of-way while reducing sediment blockage created by the original bridge. The analysis also showed that smaller piers on the new bridge would create less drag on water flow and collect less debris during high-water events, reducing flooding upstream. The Connecticut Department of Transportation (CTDOT) is developing plans to improve four curves on Route 15 in Greenwich. The purpose of the project is to decrease the number of crashes occurring on these stretches of the highway, a scenic, high-volume road known as the Merritt Parkway. The project includes applying high-friction surface treatments, pavement overlay systems with exceptional skid resistance. It also includes making superelevation improvements to the road through bituminous concrete wedging. CTDOT plans to start construction this summer. As part of its implementation of automated traffic signal performance measures to improve safety and traffic flow, the Ada County Highway District (ACHD) in Idaho will upgrade traffic signal control technology at 82 intersections in 2018 and 2019. The software enables engineers to make changes such as signal timing adjustments in real time from a central location. When ACHD tested the new system at eight intersections on one road, travel time on the 5-mile stretch was reduced from more than 10 minutes to under 8 minutes.